Pro-Gingrich super PAC offers one-sided, distorted view of Romney’s years at Bain Capital. A 28-minute political documentary released this week by a pro-Newt Gingrich super PAC presents a one-sided, often distorted and misleading view of Mitt Romney’s years leading the venture capital firm Bain Capital. Interspersed with appropriately eerie music, the video focuses on four Bain-financed companies and features heart-wrenching interviews with people who portray Romney and Bain as ruthless, quick-buck corporate raiders who reaped huge financial rewards at the expense of faithful employees. But a closer look at the companies highlighted in the video reveals a murkier picture. The video often overstates, or outright distorts, Romney’s culpability for job losses or bankruptcies. The film talks about layoffs at DDi Corp. and discusses questionable manipulation of stock prices after the circuit board company went public. But Romney had left Bain Capital a year before any layoffs and a public stock offering that ultimately netted Bain and Romney a big payday. The company’s subsequent bankruptcy filing came two years after Bain had largely divested from the company, and was the result of the dot-com bust. Moreover, the company emerged from bankruptcy, and its current CEO credits those early Bain investments for setting the foundation for the company’s current success. The film claims Romney was involved in the acquisition, management and demise of the now-defunct KB Toys. He wasn’t. Bain bought the toy company nearly two years after Romney left Bain. Likewise, the closing of UniMac’s plant in Marianna, Fla., occurred seven years after Romney left Bain and nearly two years after Bain sold UniMac’s parent company to another private equity house. More broadly, the video presents a myopic view of Bain Capital, cherry-picking some of the worst Bain outcomes to portray Bain in the worst possible light. Romney’s record at Bain Capital also includes some success stories (see Staples and Sports Authority, to name a few) at companies that added new jobs. We have twice knocked Romney for his unsupported and highly questionable claim that “net-net” he created 100,000 jobs while at Bain. There’s no thorough count of the jobs gained and lost in all the companies in which Bain invested. And Romney is taking credit for all of the present day jobs at some of the companies, even when there were other investors involved in the deals, executives who launched or ran the companies, and new owners altogether in later years. A Wall Street Journal analysis of 77 businesses Bain invested in while Romney led the firm found that 22 percent either filed for bankruptcy reorganization or closed their doors by the end of the eighth year after Bain first invested (although in many cases, that was after Bain had parted with the companies). Romney acknowledges that not every Bain deal was a hit, that some investments went bad and ended in bankruptcy, while others led to layoffs. The truth about jobs gained or lost — or the number of companies that blossomed or went bankrupt — during Romney’s tenure at Bain is much more complicated and nuanced than either Romney or the documentary suggest. There’s an interesting history to how the 28-minute film reached the public this week. The New York Times reported that the film was produced by Barry Bennett, a former consultant to a super PAC that supports Texas Gov. Rick Perry. Bennett said the material for the movie came from opposition research he purchased from one of Romney’s Republican opponents in the 2008 presidential election. Bennett tapped filmmaker Jason Killian Meath to direct the movie. Meath, the Times noted, worked on the Romney campaign in 2008. According to the Times, pro-Perry super PAC Make Us Great Again took a pass on the video, as did the Jon Huntsman campaign. Ultimately, Politico reported, it was purchased by pro-Gingrich super PAC Winning Our Future, thanks to a $5 million donation from casino mogul Sheldon Adelson, a longtime Gingrich supporter and benefactor. In the summer of 2003, then-Gov. Mitt Romney’s name showed up in headlines in Massachusetts when Bain Capital surfaced in a federal securities investigation that alleged Lehman Brothers had improperly inflated the value of stock in the Bain-financed DDi Corporation, an Anaheim, Calif., maker of printed circuit boards. The video paints a portrait of a Romney/Bain takeover of DDi that included a quick dump of hundreds of employees, and the insinuation that Romney/Bain influenced a Lehman Brothers analyst to issue a favorable stock rating so Bain could reap huge profits and escape before causing the company to tank. There are a number of inaccuracies in that story line, starting with a glaring hole in the time line. Romney left Bain in early 1999 to run the Winter Olympics, before the layoffs at DDi and before Bain took the company public (though as part of a retirement agreement Romney negotiated with his former partners, he has continued to profit from Bain’s deals). A closer examination of Romney’s and Bain’s involvement in DDi is a good case study in how murky it can be to assess credit or blame in these Bain deals for political purposes. With an investment of $40.5 million, Bain Capital — with Romney at the helm — led a group of venture capital firms that purchased a controlling interest in DDi Corp. in 1996. According to the “King of Bain” video: “A signature of Romney’s Bain Way strategy, employees were quickly fired in order to pump up profits.” It’s true that in December 1999, DDi shuttered its Colorado facility and fired 275 employees as part of a consolidation with operations in Texas. Given that Bain made its initial investment nearly three years before that, though, it’s a stretch to claim “employees were quickly fired in order to pump up profits.” And again, Romney had left Bain in February 1999, prior to the layoffs. Moreover, DDi Corp. CEO Mikel Williams noted that DDi grew very rapidly during the years of Bain’s involvement. The company had revenues of $59.4 million in 1995 — the year before the investments by Bain — and four years later, revenues topped $290 million. According to a 2003 story in the Orange County Register, DDi reached a payroll peak with 3,700 employees in 2000. “No doubt that growth, which was very rapid, was fueled by the investments from the capital markets, not only Bain,” Williams told FactCheck.org in a phone interview. King of Bain: With help from their friends at Wall Street’s Lehman Brothers, Bain was set to offer an initial public offering of stock in DDi. Lehman Brothers would issue a buy rating. And Romney and Bain would watch investors swarm. If he was watching at all, Romney was watching from afar. DDi offered a public sale of its stock on the Nasdaq in April 2000, more than a year after Romney had left Bain to head up the Olympic Organizing Committee. With an initial price of $14 a share, the IPO sale raised $170 million for DDi. Six months later, Bain began to cash out. 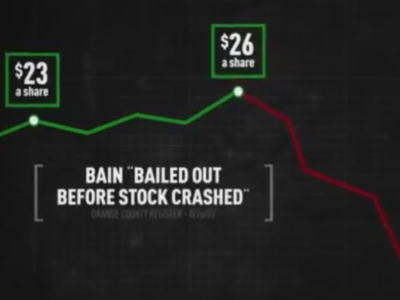 As the Orange County Register reported, it’s true — as the video states — that Bain sold some of its DDi stock in October 2000, making $39 million when the stock was as $22.50. That cut Bain’s stake in DDi to 22 percent. Bain sold even more of its stock in February 2001, raising $54 million when the stock was selling at $26.48 per share. That reduced Bain’s stake in DDi to 14 percent. Together, the two sales more than doubled Bain’s initial investment from 1996. In May 2001, Romney sold his personal shares in DDi for $4.1 million, when the price was $22.90 a share. Two years later, the stock had plummeted to 10 cents a share. In August 2003, the Boston Globe reported that an SEC probe alleged that Lehman Brothers improperly inflated DDi’s stock rating in order to win investment-banking business. According to the SEC settlement agreement, an unnamed Lehman Brothers analyst sent an e-mail to his boss in June 2000 saying that “DDi and parent (Bain Capital), and bankers” were pressuring him to issue a favorable rating for the stock. Despite the analyst expressing misgivings, Lehman gave the stock its highest 1-Buy rating and a target price of $36. The Boston Globe noted that the stock traded at $22.5 per share two days after the rating, and closed a month later at $22, “but not before it reached more than $30 a share in mid-July.” Bain and Romney cashed out long before the DDi stock tanked, but it was well after the immediate spike in stock price following the Lehman recommendation. The SEC never alleged any wrongdoing by Romney, nor was anyone at Bain Capital or DDi cited with any violations. Lehman Brothers paid $80 million to settle the SEC charges that it had manipulated stock recommendations for five companies, including DDi, though it did not admit or deny guilt. The Winning Our Future video suggests, however, that it found smoking-gun evidence to the contrary. But did it? King of Bain: But SEC filings prove otherwise. During the DDi deal, Romney is listed as a member of the Management Committee of Bain Capital, with control of over 1.3 million shares of DDi Corporation. A May 10, 2001, filing with the SEC does show that Romney was a member of the Management Committee of a Bain trust that held over 1 million shares of DDi stock. But Bain maintains that Romney held no operational role at Bain after leaving, and that “the fund management committee listing was just a legacy signatory role that involved no actual decision-making capabilities,” according to a CNN report. We asked two experts in venture capital if the SEC filing cited in the Winning Our Future video proves Romney was involved with running DDi at the time of the firings and IPO offering. Both said absolutely not. “As far as I can tell, he had no involvement,” said Steven Neil Kaplan, a professor at the University of Chicago Booth School of Business. Romney was not listed among the directors, executive officers and key employees in the registration statement filed with the SEC in preparation for DDi’s IPO offering (though five other Bain executives were). Nor was he named in subsequent proxy statements filed with the SEC as a member of DDi’s board of directors. “DDi is a bad example” to use in an ad attacking Romney, Kaplan said. There’s one other highly misleading aspect to the DDi segment. After highlighting the allegations of improper stock inflation, and that Bain quickly sold its stock for a large profit, the video then immediately cuts to the downward spiral of DDi, as if Bain’s stock sales were the cause. King of Bain: DDi ended up losing $400 million. A little over two years later, the stock was nearly worthless. The result, DDi filed for bankruptcy; 2,100 jobs were lost. Average investors without insider connections were left with huge losses. The DDi segment of the video ends with DDi in bankruptcy. But that’s not the end of the story. DDi didn’t remain in bankruptcy long. Its debt was restructured, and it maintained operations. Today, DDi is in “good shape,” Williams reports. The company is profitable. It is paying dividends, and it has 1,600 employees. “To have us portrayed as some slash-and-burn straw game is frustrating,” Williams said. In fact, he argued, DDi could be held up as an American manufacturing success story. In 2000, Williams said, there were 2,000 printed circuit board manufacturers, most of them in the U.S. or Canada. Now, he said, there are 350 at most. DDi is the second largest. In fact, he said, they might not be in business at all. The video’s two minutes on KB Toys includes falsehoods, incorrect quotes and creative video editing. The segment’s biggest deception is its sole focus: claiming Romney was involved with the acquisition, management and demise of the now-defunct KB Toys. He wasn’t. Bain bought the toy company after Romney left Bain. King of Bain: Romney and Bain bought the 80-year-old company in 2000, loaded KB toys with millions in debt, then used the money to repurchase Bain’s stock. The debt was too staggering. By 2004, 365 stores had closed. The 900 percent figure is an allegation made by the toy seller’s creditors in a suit against Bain. Forbes and the New York Times put the profit margin at 370 percent. The video also employs some creative editing when it comes to Romney’s use of the phrase “creative destruction.” That’s an economic term referring to what happens when new types of industry replace old ones, a sometimes painful process that can cost jobs. Romney, March 30, 2010: I think it’s important to underscore something, which is that economists and business people can acknowledge that creative destruction does enhance productivity and raise the standards of living of the people of a society. That sounds great. Except creative destruction does not sound real good if it happens to you. And for an economy to thrive, as ours does, there a lot of people who will suffer as a result of that. The video also cites a Tampa Tribune article when it makes this claim about Bain’s profits from KB Toys: “Romney and other top executives’ take: $120 million.” But the article doesn’t mention Romney, and it said the $120 million went to “Bain and KB managers,” not just Bain. The $120 million figure comes from a lawsuit creditors filed against Bain — which received $85 million of the $120 million. Another untrue claim: “Romney and Bain’s profits, at the expense of 15,000 jobs, was described by the Boston Herald as ‘disgusting.’ ” The newspaper didn’t describe anything as “disgusting.” Rather, it quoted a laid-off KB Toys’ employee as saying Bain executives made “disgusting” profits. The article also doesn’t mention Romney or 15,000 jobs. The 15,000 jobs figure came from a 2009 ABC News article reporting on KB Toys’ second filing for bankruptcy and its plan to close all of its stores. However, a Reuters article put the number at 10,850, saying that more than half of those workers were seasonal. KB Toys emerged from bankruptcy in 2005, but went back into bankruptcy and liquidated its stock in 2008. Toys R Us purchased the KB Toys brand name for $2.1 million, but the company itself is out of business. UniMac: Who’s to Blame for Plant Closure? Romney’s involvement in the company was minimal. Bain agreed to purchase UniMac’s parent company, Raytheon Commercial Laundry, in February 1998, and the deal was finalized in May of that year. Romney left Bain in February 1999. Bain sold the parent company of UniMac, which was renamed Alliance Laundry Systems, to another private equity company in 2004. It was the new owner, not Bain, that closed the Marianna factory in August 2006 and moved its operations to Ripon, Wisc. About 400 jobs were lost in Marianna, but 250 jobs were added at the Ripon plant. Bain purchased Raytheon Commercial Laundry, which included UniMac, in May 1998 for $358 million. The company, now under the name Alliance Laundry Systems, employed 1,800 people and was headquartered in Ripon, Wisc. Romney left Bain Capital less than one year later in February 1999 to work on the 2002 Winter Olympics in Salt Lake City. He never returned to Bain. Romney “formally transferred his ownership of Bain Capital Inc. to other partners” in 2001, according to the New York Times. At the time, the factory in Marianna was open and continued to make washing machines. In 2001, Alliance Laundry added approximately 75 jobs to the Marianna plant when it closed its Cincinnati facility. At this point, Alliance had about 1,600 employees — about 200 fewer than when Bain purchased it in 1998. In December 2004, Alliance Laundry announced that it had agreed to sell the company, including its UniMac division, to Teachers’ Private Capital, the private equity division of the Ontario Teachers’ Pension Plan, for $450 million. That private equity house, not Bain, closed the Marianna factory and moved the UniMac line to the facilities in Wisconsin. That decision was announced in October 2005, and the plant closed in August 2006. So, did Romney and Bain upend UniMac’s operations and gut its employees, as the film contends? The Florida factory did not close, nor were the majority of its workers laid off, by either Romney or Bain Capital. Both Baxley and Tommy Jones lost their jobs in 2006, when the factory closed, not under Bain, as the film implies. The two men started up their own washing machine repair service, Washers-R-Us, using the skills acquired in the Marianna factory. Washers-R-Us: We both spent many years helping distributors service the Alliance products. … In 2006 Alliance announced that their factory in Marianna was being moved to Ripon, WI and many people were looking for jobs. This included Tommy and Mike and thus Washers-R-Us was born as a company. Update, Jan. 15: Baxley and the Joneses told the Wall Street Journal that the film leaves the false impression that they blame Bain for the plant closing and layoffs. They each received raises and promotions under Bain, the Journal reported Jan. 14. Wall Street Journal, Jan. 14: During Bain’s ownership, the three employees each received multiple promotions, they said. After the plant closed, Mr. Jones said, he landed a consulting contract with UniMac’s parent company, helping to coordinate the move of that plant and another in Florida. He, his wife, Tracy, and Mr. Baxley parlayed that work into Washers-R-Us, a commercial washing-machine sales-and-service business in Marianna. There was probably some net job loss when Bain owned UniMac, but the commercial laundry sector as a whole experienced job loss during that time. The total workforce in the commercial laundry sector fell from 4,204 employees in 1999 to 3,025 workers in 2002. The film also revisits the closing of a paper products plant in Indiana — an incident that first dogged Romney during his failed 1994 campaign for U.S. Senate. In that race, Sen. Ted Kennedy ran a TV ad featuring striking plant workers at SCM Office Supplies talking about cuts in jobs, benefits and pay after Ampad Corp., a Bain company, took over. Ultimately, the strike — which started Sept. 1, 1994, just two months before the Kennedy-Romney election — resulted in the plant closing in February 1995. More than 200 people lost their jobs. The ex-workers’ stories in the Winning Our Future film are powerful and heartfelt, and for the most part true, with one caveat. Romney was on leave from Bain when it purchased SCM Office Supplies and was not part of Ampad’s management team — despite a claim in the film to the contrary. Romney officially announced he would run for Senate on Feb. 2, 1994. Ampad bought SCM Office Supplies Inc., a subsidiary of Smith Corona, in July 1994. The labor problems started almost immediately after the sale. Under the terms of the sale agreement on file with the Securities and Exchange Commission, Ampad did not have to honor the “bargaining agreement with the Union.” The Boston Globe reported that “within hours [Ampad] released some 250 plant workers” at the Indiana plant. The workers had to reapply for jobs, the Globe reported, and all but 58 returned. But not for long. The plant closed seven months after the sale and five months after the strike began. An ex-worker in the film says, “The man who was in charge of Ampad Corporation at that time was Mitt Romney.” That’s not true. Romney was on a leave of absence from Bain during the purchase of SCM Office Supplies and the subsequent strike. During the 1994 election when the plant strike became a campaign issue, Ampad’s president, Charles Hanson, told the Globe that Romney was “not involved in the operation of his company,” and did not sit on the company’s board of directors. However, Bain had three executives on the board — including Marc B. Wolpow, a former managing director at Bain who told the Los Angeles Times that Romney could have prevented the closing of the Indiana plant, which occurred after the 1994 election and after Romney returned to his job at Bain. 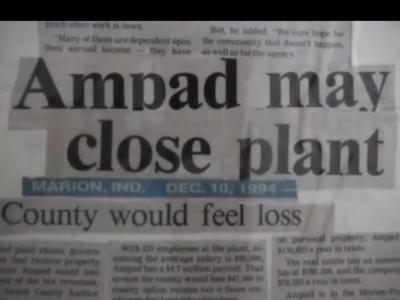 Despite its labor problems in Indiana, Ampad thrived under Bain — at least at first. When it went public in June 1996, Ampad reported that sales had grown at an annual rate of 34 percent every year since 1992, when Bain purchased the company from the Mead Corp. In 1995, the company’s net sales were $617.2 million — up from $108 million in 1991. However, Ampad debt grew even faster. The Globe reported that by 1999 “Ampad’s debt reached nearly $400 million, up from $11 million in 1993, according to government filings.” The Wall Street Journal reported that Bain turned a profit of $102 million on a $5 million investment in Ampad. The Globe wrote that Bain made millions in management fees and acquisition fees, as well as tens of millions from the initial public offering. Ampad defaulted on its debt and filed for bankruptcy in January 2000. At that time, Bain agreed to reduce its annual management fee from $2 million to $1.5 million. By December 2000, the company ceased public trading. At the time, Bain held about 35 percent of the company’s stock, which was now worthless. Ampad emerged from bankruptcy in 2003 under the ownership of Crescent Capital Investments. The company had 3,198 full-time employees when it went public and 3,834 full-time employees when it filed for bankruptcy, SEC documents show. It is now owned by Esselte, a privately owned company headquartered in Connecticut. We tried to obtain current employment figures for Ampad from Esselte, but have yet to hear back from the company. If we do, we will update this item. Two days after the release of the Winning Our Future video, Gingrich released a statement calling on his super PAC to edit any inaccuracies out of the film. “I am calling for the Winning Our Future Super-PAC supporting me to either edit its ‘King of Bain’ advertisement and movie to remove its inaccuracies, or to pull it off the air and off the internet entirely,” Gingrich wrote. Meanwhile, President Barack Obama’s deputy campaign manager, Stephanie Cutter, ripped out a four-page memo calling Romney a “corporate raider” at Bain. “Taking advantage of an uneven playing field, where there was one rulebook for those at the top and another for everyone else, Mitt Romney and his friends made money hand over fist while working families lost their grip on the middle-class lifestyle they earned,” Cutter wrote. In other words, if Romney wins the GOP nomination, expect to be hearing a lot more about Romney’s time at Bain. Phillips, Frank. “Romney Investment Surfaces in Probe, Bain Capital Profits Called into Question.” Boston Globe. 19 Aug 2003. Phillips, Frank. “Romney Says Profit Unknown in DDi Sale, Had Left Bain Befor Events Studied by SEC.” Boston Globe. 21 Aug 2003. Confessore, Nicholas, Drew, Christopher and Creswell, Julie. “Buyout Profits Keep Flowing to Romney.” New York Times. 18 Dec 2011. Bloomberg News. “Dynamic Details to Fire 275 in Colorado.” 04 Jan 2000. Connecticut Department of Banking. Lehman Brothers Inc. Consent Decree. 02 Sep 2003. Securities and Exchange Commission. 13D Filing, DDi Corp. 10 May 2001. Primack, Dan. “Gingrich’s ‘Bain bomb’ fizzles.” CNN Money. 12 Jan 2012. Securities and Exchange Commission. Form S-1, Registration Statement: DDi Corp. 28 Jan 2000. Securities and Exchange Commission. Proxy Statement: DDi Corp. 30 Apr 2001. Finkle, Jim. “Dissecting DDi: Only venture capitalists seem to have profited from the bankrupt Anaheim company.” Orange County Register. 26 Aug 2003. Gavin, Robert and Pfeiffer, Sacha. “Plenty of ‘pitting’ preceded Romney’s profits.” Boston Globe. 03 Jul 2007.
Business Wire. “Bain Capital Acquires Majority Ownership of Details Inc.” 18 Nov 1997. Maremont, Mark. “Romney at Bain: Big Gains, Some Busts.” Wall Street Journal. 09 Jan 2012. Kirkpatrick, David D. “Romney’s Fortunes Tied to Business Riches.” New York Times. 04 June 2007. Confessore, Nicholas et al. “Retirement deal keeps Bain money flowing to Romney.” The New York Times. 18 Dec 2011. “KB Toys sale finalized.” Columbus Business First. 8 Dec 2000. Big Lots Stores Inc. v. Bain Capital. Court of Chancery of Delaware. 28 Mar 2006. Vardi, Nathan. “Toy Story.” Forbes. 18 Apr 2005. Romney speaking at Emory University. Youtube. 30 Mar 2010. Sasso, Michael. “Will it grow?” Tampa Tribune. 6 May 2007. Chasan, Emily and Sivaraman, Aarthi. 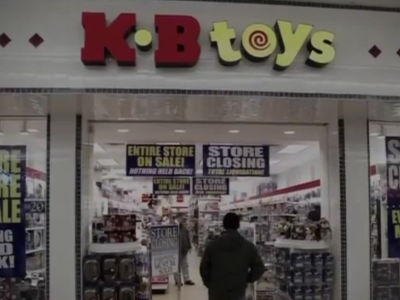 “KB Toys files for bankruptcy, to close all stores.” Reuters. 12 Dec 2008. Pereira, Joseph and Kell, John. “Toys ‘R’ Us Buys KB Toys’ Brand.” Wall Street Journal. 4 Sep 2009. “Company news; Raytheon in $358 million deal to sell laundry business.” The New York Times. 24 Feb 1998. “Alliance Laundry Systems Completes Acquisition.” Business Wire. 5 May 1998. Carson, Daniel. “Alliance Laundry phasing out operations at Marianna plant.” News Hearld. 19 Oct 2005. Alliance Laundry Systems. “Alliance Laundry To Consolidate Manufacturing Operations.” Press Release. 14 Oct 2005. “Alliance Laundry Systems Adds Product Line to Marianna Facility.” Business Wire. 7 Jun 2000. “Industry report.” The Gale Group. Undated. Lehigh, Scott and Frank Phillips. “GOP’s Romney declares, says Kennedy out of date.” Boston Globe. 3 Feb 1994. U.S. Securities and Exchange Commission. Acquisition or disposition of assets Report on Smith Corona Corporation. 19 Jul 1994. Phillips, Frank. “Romney firm tied to labor fight; Jobs, benefits slashed at Ind. paper plant.” Boston Globe. 23 Sept 1994. Drogin, Bob. “To assess Romney, look beyond the bottom line.” Los Angeles Times. 16 Dec 2007. U.S. Securities and Exchange Commission. Form S-1, American Pad & Paper Company. 6 Jun 1996. Maremont, Mark. “Romney at Bain: Big Gains, Some Busts.” Wall Street Journal. 9 Jan 2012. Abundis, James and Robert Gavin. “Ampad: A controversial deal.” Boston Globe. Undated, accessed 13 Jan 2012. Securities and Exchange Commission. Form 10-K, American Pad and Paper Company. 14 Apr 2000. Securities and Exchange Commission. Form 8-K, American Pad & Paper Company. 21 Dec 2000.
Business Wire. “American Pad & Paper LLC Announces New Board of Directors.” 10 Sept 2003. Esselte. “Esselte acquires Ampad.” 8 Jun 2010.